Today the Second International military and technical forum “Army-2016” has come to an end. The Closing ceremony of the forum was participated by the Russian Defence Minister General of the Army Sergei Shoigu. The Head of the military department noted that the results of the forum proved it to become one of the leading world military exhibition events. “In the course of the forum, our foreign partners have seen that we are open for joint projects in the military and technical sphere. We are grateful to the representatives of foreign countries who have come in this difficult international situation and are ready to cooperate with Russia,” said Sergei Shoigu. KUBINKA (Moscow Region), September 8. /TASS/. The combat capabilities of the new Russian tank Armata were for the first time shown during a closed exhibition at the international military-technical forum Army 2016, the general director of the manufacturer, Russian machine building company Uralvagonzavod, Oleg Siyenko, told TASS in an interview. “We are also demonstrating our Armata, but now it poses not only as an exhibit but also shows its combat capabilities in dynamics and gunnery (during a closed viewing), which only happens for the first time at expositions,” Siyenko said. He said the corporation presents 50 specimens of military and special hardware, including items made jointly with Russian and foreign companies. In particular, Siyenko said, the exhibition showcased the Barys armored personnel carrier, manufactured jointly with Kazakhstan Engineering on the platform of the Paramount company, with a 57-millimeter weapon station produced by Uralvagonzavod. “We have here a light armored personnel carrier with a 30-millimeter weapon station, manufactured jointly with Kamaz, which has already undergone tests. For the first time we are demonstrating a mortar on the basis of the UAZ vehicle, as well as a vehicle on the Ural chassis with a 120-millimeter gun,” he said. Armata is a unified heavy platform used to build a main tank, an infantry combat vehicle, an armored personnel carrier and other armored vehicles. 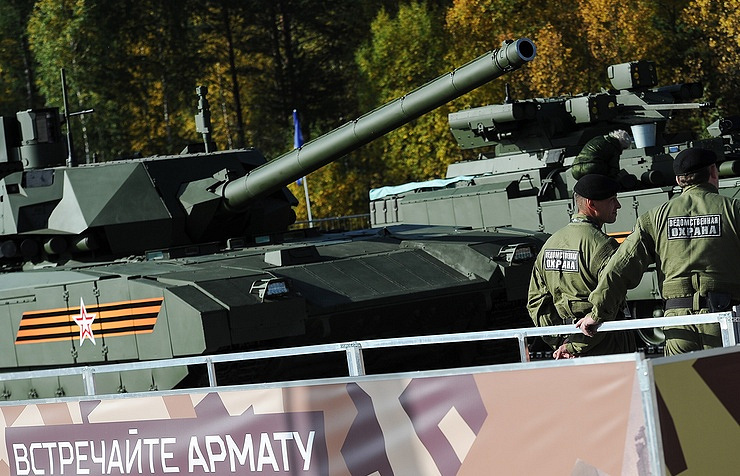 The tank on the basis of Armata is expected to get an unmanned turret. The crew will be placed in an isolated armored capsule. Serial production of the new tanks may start in 2018. The tank was first shown to the general public at last year’s Victory Parade in Moscow. On Thursday, the First Deputy Defence Minister Ruslan Tsalikov visited the International military and technical forum “Army-2016” where he got acquainted with the expositions of the leading manufacturers of the Military industrial complex. He also presented greetings of the Head of the Russian military department to the participants of the international forum. In the new building of the universal training and demonstration centre “Patriot”, Ruslan Tsalikov observed the exposition grounds of the enterprises which are fulfilling the State Defence Orders. During the official visit, Ruslan Tsalikov thanked the participants for the fruitdul work and wished them further success. He also expressed his gratitude to the builders who had constructed the new complex in Kubinka just in 1,5 years. September 7 – Army-2016 international military-technical forum opened in the Patriot theme park near Moscow on August 6. Forum will last till September 11. More than once thousand companies will display more than 11,000 samples of weapons and military equipment there. Marine activities of the event will be held in Kronstadt (St. Petersburg) and Vladivostok. The exhibits demonstrated at the Army-2016 forum. September 3 – Photos of the Phlox self-propelled truck-mounted gun have appeared on the Internet, posted by Uralvagonzavod Corp.’s deputy director Alexey Zharich, Rossiiskaya Gazeta reported. Spy photos. We sent Phlox… to the Army-2016 forum. Come and see it. The Uralvagonzavod corporation will present some 50 pieces of military equipment. The Phlox 120mm self-propelled howitzer is just one of about fifty advanc…ed weapons systems that will have their world premiere during the Army-2016 military technology forum outside Moscow. Most of the new system’s features remain under wraps. What is known is that its 120mm cannon a long-range gun, a howitzer and a mortar all in one. Mounted on updated version of the Ural-4320 truck with an armored cabin, it has an effective firing range of up to 10,000 m and a minimum range of just 100 meters. It has an initial ammunition supply of more than 80 complete rounds. The Phlox fires in automatic mode and its gun is capable of rotating 360 degrees to lock on to a target. It features an remote-controlled 12.7 mm machinegun mounted on top of the truck and a Shtora-like electro-optical jammer that disrupts antitank guided missiles, laser rangefinders and target designators.